Servicing Anderson, Greenville, Seneca and ALL Surrounding Areas! 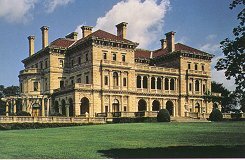 The "Cottages" of Newport - stately summer homes set in the magnificent surroundings of Rhode Island Sound - are world famous for their grandeur and beauty, largely because of the efforts of The Preservation Society of Newport County. Built in the heydays of the late nineteenth and early twentieth centuries, the American palaces were a celebration of the new wealth of the world's leading industrial society. The Preservation Society was founded in August 1945 with the intent of preserving Newport's architectural and artistic heritage by restoring and revitalizing Newport's outstanding properties. The Society today keeps eight properties open to the pubilc, conducts an extensive education program involving the houses and furnishings and leads a beautification program for the specious gardens and grounds. The interior furnishings of the houses are virtuall irreplaceable.They include some of the hinest examples of tapestries, portraits, wall panels, ceiling paintings, French and Oriental carpeting, fabric wall coverings and opulent bed linens. Over the years the precious furnishings had begun to fade. Curator, Paul F. Miller was very concerned at the conspicuous deterioration and resolved to find a way to protect the unique furnishings from damaging sun light. In 1995 he retained the local solar control window film specialist to install Llumar Window Film, thus virtually eliminating the sun's damaging UV rays, the principal cause of fading. The film, Llumar N1050 and N1035, neutral in color, can scarcely be detected when in place on glass adn does not impair the views afforded by magnificent windows or darken interiors. Additionally, the film reduces harsh sun glare and saves on energy by cutting down on heat loss and gain through glass. The Breakers, a Renaissance Revival structure built without limitations of scale or expense by Cornelius Vanderbilt II, has already been treated with Llumar film as has the Alice Brayton House set in the impressive seven acre Green Animals, the innovative and most northern topiary garden in America. Installation of solar conrol window film is planned on a number of the Society's other properties including Marble House, Rosecliff and The Elms. "Our Society is committed to the restoration, preservation and maintenance of historic Newport properties. We see them as a major link between Newport and America's past and we will not let them fade away." Copyright © 2001-2017 SSCWT Corp. All rights reserved.